Looking for that perfect pillow? 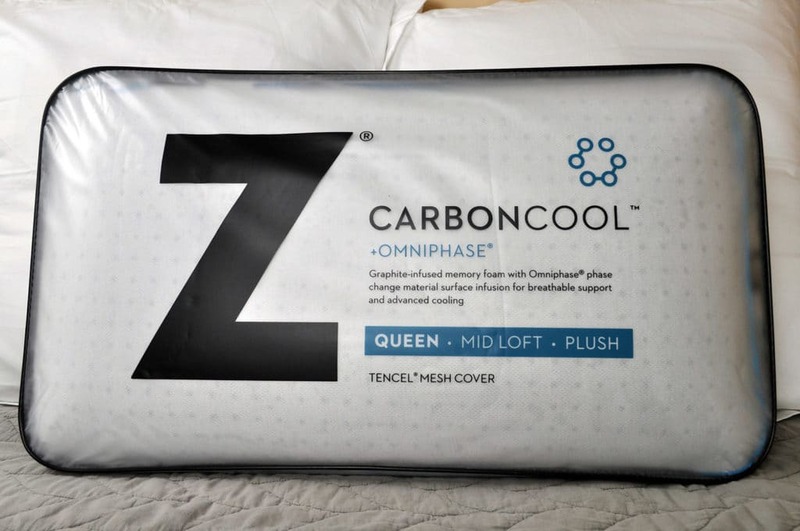 While it can be difficult to know which one will be best for you, this review will add another contender to the mix, Malouf’s CarbonCool pillow. Curious how it will stand up to the Sleepopolis sleep test? Find out now as we dive into the complete review. No time to browse? No problem! Click here to get right to the summary! The Malouf CarbonCool pillow is formed with a graphite-infused molded memory foam. The graphite helps to dissipate heat during sleep, while the memory foam provides that classic hug and contour that sleepers love (or sometimes hate) about memory foam. 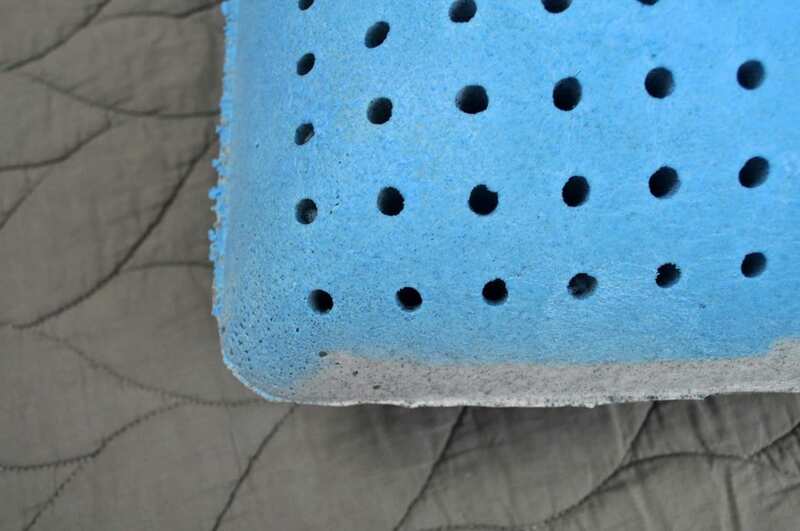 The memory foam is also aerated with small holes about 1/8” in diameter, spaced approximately every inch throughout the body of the pillow. This is also for air circulation and optimal cooling. One side of the pillow is strictly the graphite-infused memory foam, and the other side utilizes a phase change material for added cooling. Phase change materials can do a great job at regulating the temperature of the pillow and adjusting to a sleeper’s personal needs. The holes in the body of the foam help air circulate and dissipate heat when needed. 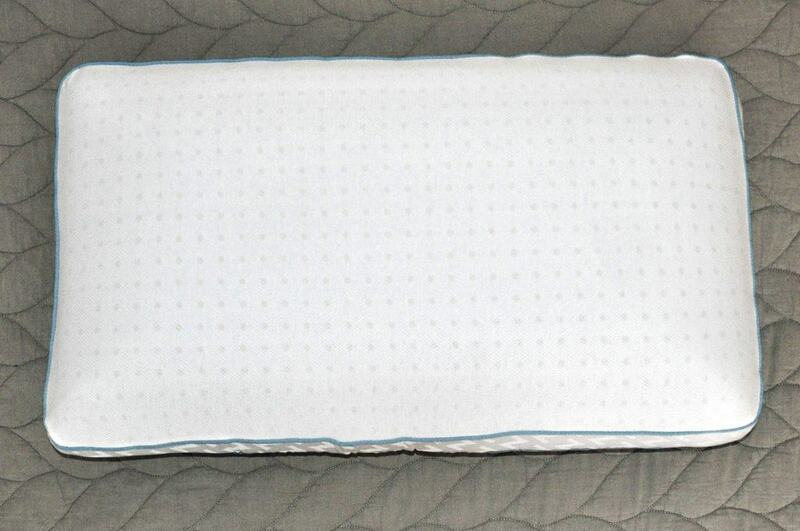 This pillow has a medium loft (5-6”), which is suitable for all types of sleepers, stomach, side, or back. The cover of the CarbonCool pillow is a Tencel mesh. It is very breathable and moisture wicking against liquid spills. (Although it does wick water away, this cover is not waterproof.) There is a zipper closure at one end, which allows the cover to be easily removed for washing. 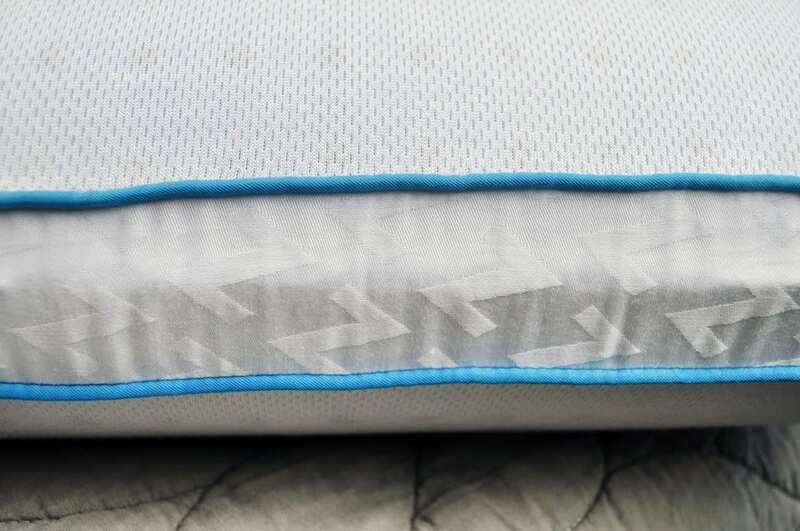 The sides of the cover are slightly thicker than the mesh surfaces, joined together with a bright blue cording around the body of the pillow. This provides a nice contrast and an appreciated aesthetic detail. The feel of the Carbon Cool pillow is impressive for a memory foam pillow. Although memory foam is notorious for heat retention, this pillow is quite cool to the touch. When I first put my head down on the phase change side of the pillow, I instantly felt how much cooler it was. After about 15-20 minutes, the pillow regulated a bit. While still cool, it was not as drastic and made it comfortable to sleep throughout the night. The aerated foam and materials did a nice job of dissipating heat and keeping me comfortable throughout the night. Aside from exceptional cooling, the overall feel of this pillow is very nice. It is a molded memory foam, but retains a notable amount of bounce and responsiveness. When sleepers initially lie on this pillow, there is a decent amount of immediate sinkage. The CarbonCool pillow has a bit more of a rounded contour. It bounced back fairly quickly when I awoke and returned to its original shape instead of leaving a defined imprint in the pillow when I got up. The support of this pillow provides a nice amount of pushback without an excessively slow response time or firmness. One negative to note about this pillow was the smell. Upon arrival, there was a moderate to high smell factor, which made it difficult to sleep on the first several nights. I would recommend letting this pillow air out for 4-5 days prior to use. However, if you are sensitive to smells, you may want to let it air out for a couple of weeks. After about two weeks, the smell was mostly gone, only noticeable if I buried my nose into the foam. While this may not be a factor for some, sleepers with more sensitive noses or those looking for a natural pillow may want to consider this prior to purchasing. Smell – There was a strong smell for the first 4-5 days, but it had almost completely dissipated after airing out for 2 weeks. Trial – No trial period noted. Should I buy the CarbonCool pillow? Want exceptional cooling: The cooling is simply amazing on this pillow. 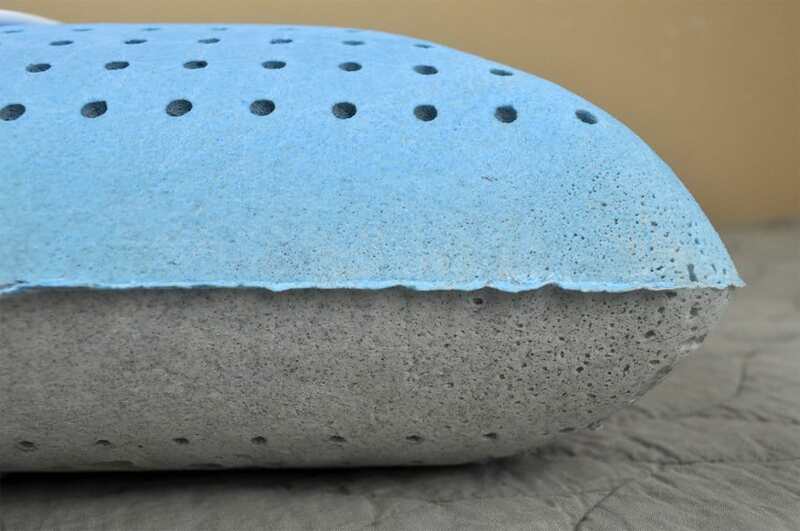 Nearly every material on this pillow was designed to optimize cooling. 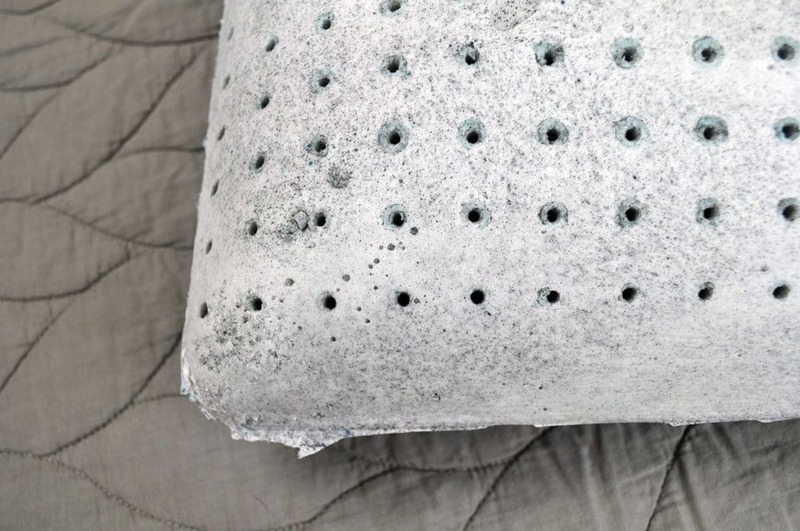 The combination of graphite-infused memory foam, aeration holes, phase change material, and a breathable Tencel cover makes the cooling on this pillow extremely hard to match. Want memory foam: Although cool and breathable, this pillow retains that classic memory foam contour and hug. When sleepers lie on the pillow, they can feel the foam begin to form around their head, providing a nice, rounded contour. Want a slightly faster response time: Despite being memory foam, this pillow has a fairly fast response time with a nice level of bounce. Because of this, it adjusts quickly to any tossing or turning during the night. 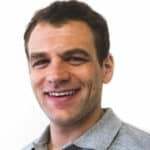 Do not mind spending a little more: Memory foam with unmatched cooling is a very unusual blend—and it’s extremely costly. At $199 for a Queen-sized pillow, this is one of the most expensive pillows I have reviewed to date. That being said, if cooling is critically important and you need memory foam, this pillow is an excellent choice. The Travel pillow could be used as well for sleepers on a tighter budget as it’s only $99 and has the same qualities. For more information on Malouf’s CarbonCool pillow, visit Amazon.com. 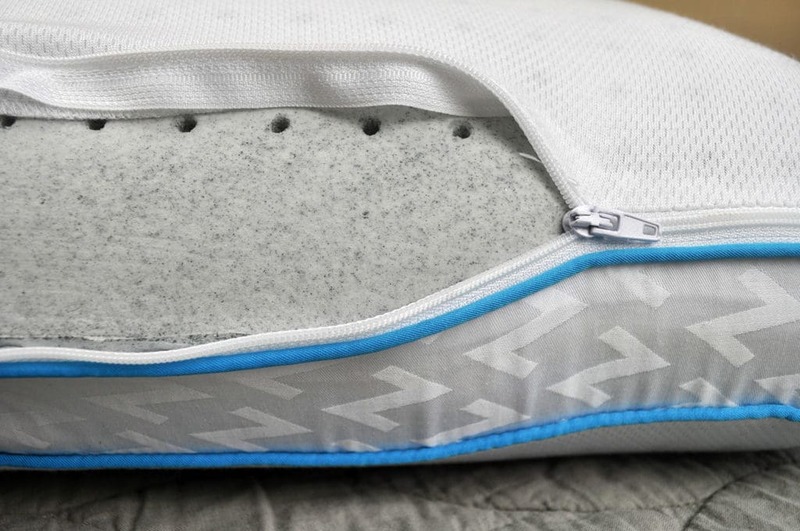 The Malouf CarbonCool pillow is unique for its category, providing excellent cooling while retaining the classic features of a true memory foam. The phase change material, graphite-infused foam, aerated holes, breathable mesh, and Tencel cover all contribute to its cooling features. This medium loft pillow makes a great choice for sleepers who want memory foam as well as the absolute best in cooling technology.